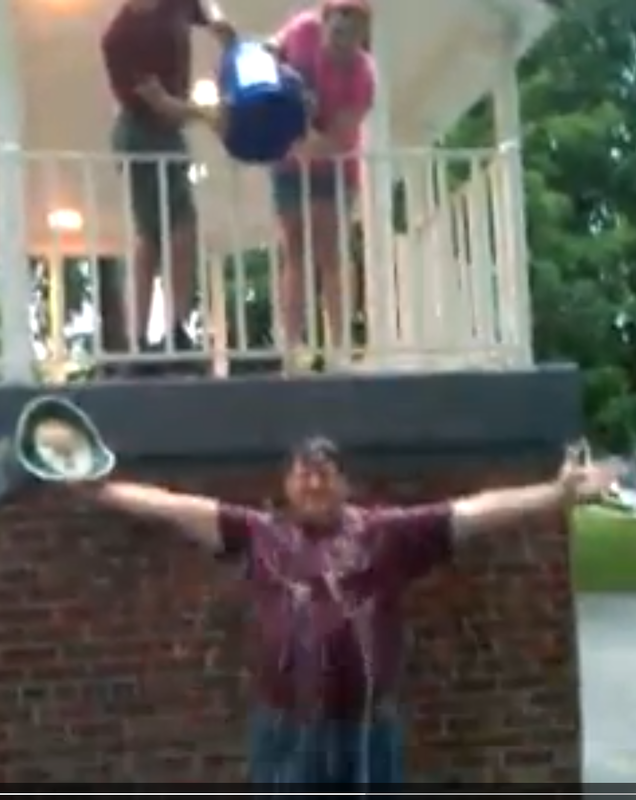 Do Catholics Really Need to Throw Cold Water on the Ice Bucket Challenge? Despite growing calls to the contrary in many Catholic circles, I took the ALS Ice Bucket challenge earlier today at a Boy Scout Eagle Service project. So, I gather folks might want to know why. Amyotrophic lateral sclerosis (ALS), or Lou Gehrig’s disease, is a terrible muscular disease in which people lose their skeletal muscle function, including the muscles that help us breathe. It was 75 years ago this summer that Yankee legend, Lou Gehrig, announced his departure from baseball in a speech that has become as iconic as the Iron Horse himself. A major research and advocacy organization, the ALS Association (ALSA) has been the beneficiary of some $40 million raised in an awareness campaign that has as a simple device people calling out friends and family, challenging them to either give $100 or have ice water dumped on their heads. Many, such as your humble author (with a little frat boy left in him), have elected to do both. The problem for some is that ALSA has been an advocate for embryonic stem cell research, which tears apart a human being in the embryonic stage of development and uses its cells for research purposes. That’s a major hurdle. But now for some facts. ALSA has said that they have one embryonic stem cell line that has been funded by a private donor, and that work on this line of cells is nearing the end of its lifespan. That’s not hard to believe . Almost nobody pursues embryonic stem cell research anymore. The reason is simple. They are too young, immature, and undifferentiated to control. They grow into tumors. There are too many unknown variables. They are a nightmare that have produced zero return on investment, and for both parties in grant applications, that’s a big, big deal. Labs have been abandoning them like rats jumping from a sinking ship. Researchers now use induced pluripotent stem cells (iPSC’s), which are generated directly from adult cells. We also now have hundreds of therapeutic uses from adult stem cells. So, embryonic stem cells are yesterday’s failed experiment. Still, that won’t assuage some who are entirely intolerant of any organization that might have ESC’s still in research. For the faithful Catholic this is where the ethical waters get a bit muddy. Whether immunization with these vaccines is permissible depends upon whether their use involves the Catholic in cooperation with evil. Briefly, formal cooperation arises when an individual shares in the intention or the action of another who does what is wrong. Immoral material cooperation occurs when one who cooperates makes an essential contribution to the circumstances of a wrongdoer’s act. Thus the question about vaccines derived from aborted fetuses concerns whether or not their use involves the Catholic in immoral cooperation with the evil of abortion. The answer, in short, would appear to be “no.” For it seems impossible for an individual to cooperate with an action that is now completed and exists in the past. Clearly, use of a vaccine in the present does not cause the one who is immunized to share in the immoral intention or action of those who carried out the abortion in the past. Neither does such use provide some circumstance essential to the commission of that past act. Thus use of these vaccines would seem permissible. The author, Dr. Ted Furton, is from my conversations with him, and my reading of his material, a profoundly good, moral, and decent Catholic man and scholar. His rationale in the case of the vaccines in question can be applied to donating to ALSA, which is winding down its sole line of ESC’s (that have private funding). It’s an old cell line, just as the vaccine culture line is an old cell line. Unlike the vaccine cell line, ALSA’s one ESC line is on a dead end trajectory. So, what’s really at issue here? Stem cell researchers are licking their wounds after more than a decade of fruitless endeavor. Virtually all recognize that the morally unproblematic ASC’s and iPSC’s are bearing great fruit, thanks to their being more mature and differentiated (hence more easily controlled). Ought we withhold funding from researchers at ALSA whose administrators today pay weak lip service (and no more money) to one of science’s greatest boondoggles? For what it’s worth, as a Catholic Molecular Biologist who has raged for a decade at this ugly abuse of science, I think it’s more important to fund the research community’s redemption than to rub their collective nose in past sins. ALSA has many great minds on staff. New money goes to morally acceptable research. Like the son in the parable who initially refused his father’s request, they have come about and are now doing what we have called upon them to do for over a decade. We need to stop pouring cold water on the Ice Bucket Challenge. I plan to donate to ALSA and to earmark the money for research on iPSC’s (kinda redundant, as the ESC line is funded by a sole donor). However, the earmark sends a message, a good message for a good cause. I hope that it helps to end this dread disease and that we can look back and have ownership in having a part in it all, and having funded moral means to such a good end. Given that we have seen chicanery in embryonic stem cell research, is it wise to trust whatever the researchers are saying they are doing is what they are actually doing? I appreciate your clarification, Dr. Nadal. Thank you Dr. Nadal for a voice of reason. Those who oppose the ALS Association are doing so for irrational, emotional reasons rather than based on fact. I appreciate you clarifying this for all of us. I have to respectfully disagree with your decision to give to the ALSA. They also gave half a million to the Northeast ALS Consortium (NEALS) which is currently running a clinical trial using cells from an electively aborted fetus. I am sure they will give NEALS even more money now. I have trouble giving money to organizations that think it is OK to use aborted innocents for medical purposes . I think it normalizes and legitimizes the practice of mining abortion for harvetable biololgical material. Why not give to an ALS organization that is much less likely to fund objectionable research? Rebecca, Did you read the Ted Furton article I linked to? I read your excerpt and understand his reasoning and I understand yours. I still think it is important to voice our objection whenever possible to the use of aborted fetuses as harvestable biological material. If we don’t, then the practice may expand. I choose not to give to organizations that legitimize that practice. In the case of vaccines, parents are held hostage.There are no alternatives to some vaccines made from aborted fetal lines. We vaccinate, but do so with objections. In the case of the ice bucket challenge we have a choice to send our money where we want. In that case, I believe we should send it to organizations where it is less likely we are supporting morally suspect research. There are good alternatives. I don’t think there are many who have voiced the objections to embryo-destructive research or aborted fetal cell lines as much as I have, with you being one of the few exceptions. In this, there is no philosophical or moral distinction between us, and I always read your columns with great satisfaction that there is someone who writes so well on these matters. So, without the need to defend ourselves to one another, the difference here is a pragmatic one. While embryo-destructive research goes on, it is seriously in decline. Far more adult stem cell lines are being funded than are ESC’s. The question is really about who is doing great science in this area, and who is doing collaborative work with other labs? If I have the opportunity to earmark donations for ethical research in the lab of an excellent researcher, then that is completely morally acceptable. If I have an opportunity to demonstrate to an organization that I am part of a growing movement that wants research monies spent on research that is not only morally and ethically acceptable, but also scientifically fruitful, and if that helps the organization to move away from ESC’s (because the DONORS demand it), then that’s even better. I’ve heard that there are Catholic groups, but I am not familiar with any labs that are doing cutting edge ALS research, which is what the challenge is all about. Many Catholics have used this windfall to promote organizations that are doing morally acceptable work, albeit in different areas. If they want to, that’s fine. But being an evangelist to my own scientific community, if my $100 opens conversations and demonstrates that “Catholic” is first and foremost about redemption (especially for scientists looking for a way back to fruitful and ethical research) then it’s money well spent. If it can accomplish that AND help with a cure for ALS, then it’s money VERY well spent. Another thought…I cannot help but wonder if pro-lifers were really vocal in opposition to IVF and surrogacy when these techniques were in their infancy if the problems we are now seeing with massive creation and destruction of life and “children as products” would not exist, or would be significantly better. I fear that aborted fetal cells will become a market item with a whole new set of abuses if we are not super vocal now about their use. So I understand about being morally removed from embryonic and fetal stem cells, but I worry about the future if we don’t shout to the roof tops. Thanks for your response. I appreciate your reasoned approach, as always, and I appreciate that you are not a “separatist.” I agree that some of the alternatives were not acceptable to me for this challenge because they were not ALS specific. I recommended Team Gleason because their mission is to help those with ALS by developing technologies to make their lives better. Not research into the disease per se, but still cutting edge :). I will send you an e-mail shortly!